My beautiful heavily pregnant sister-in-law braved the torrential rain to come over for dinner this week. Oh, did I tell you? I’m going to be an aunty! It was less than a year ago that my little brother got married and I made my first (and last) wedding cake. And it’s hard to believe that in less than 6 weeks he’ll be a dad; mum and dad will be nanny and grandad (or nan and pop, they’re still deciding), my grandad will be even greater than he already is, and I’ll be an aunty. His or her impending arrival is the source of so much joy in our family, I wonder if they know just how excited we are to meet and love them. Mum-to-be was lured over with the promise to cook from the latest edition to my cookbook family (and a birthday present from her), The Sprouted Kitchen. I raced home to strategically place buckets throughout the studio and pull old towels to mop up the wet that had already puddled. It was like being under siege – the relentless rain on the corrugated iron roof, a defening chorus of elephants. It’s miserable, so we need something warm, starchy and comforting. 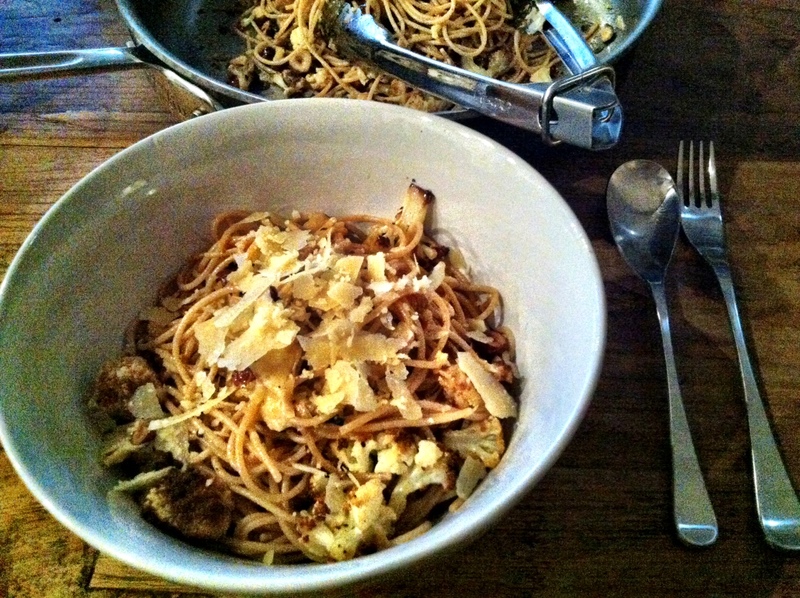 A Roasted cauliflower capellini ticks all these boxes and won’t be too heavy. I love cauliflower. It’s best sautéed or roasted, not boiled or steamed to waterlogged mushy oblivion. What is that magic that happens when cauliflower is roasted to turn it from pale and bland to caramelised sweet and nutty – almost popcorn or toasted-cheese-like? Cauliflower might just be the new superfood for 2013 – full of vitamins and antioxidants; it’s also a great cardiovascular, digestive, detox and cancer prevention support. And they’re available all year round. Tonight, the crispy brown florets of concentrated flavour are tossed through pasta with a light brown butter, a sting of white balsamic, sweet toasted hazelnuts, fresh basil and a bite of pecorino. There were even a few baby kicks of approval. I think I know who’s going to be the favourite aunty… If I have anything to do with it! 01 Feb	This entry was published on February 1, 2013 at 9:53 am. It’s filed under Delicious and healthy!, Lucy's plate, Recipes, Uncategorized and tagged Cauliflower, Pasta, Sara Forte, Sprouted Kitchen. Bookmark the permalink. Follow any comments here with the RSS feed for this post. Lucy this looks gorgeous! And if your niecelet or nephew likes food – you will probably be a shoe in for favorite. Not to mention howmuch your Sis-in-law must love you right now!